Let’s not mince words: This here is one of the most delicious dishes I’ve had the pleasure of eating all year. 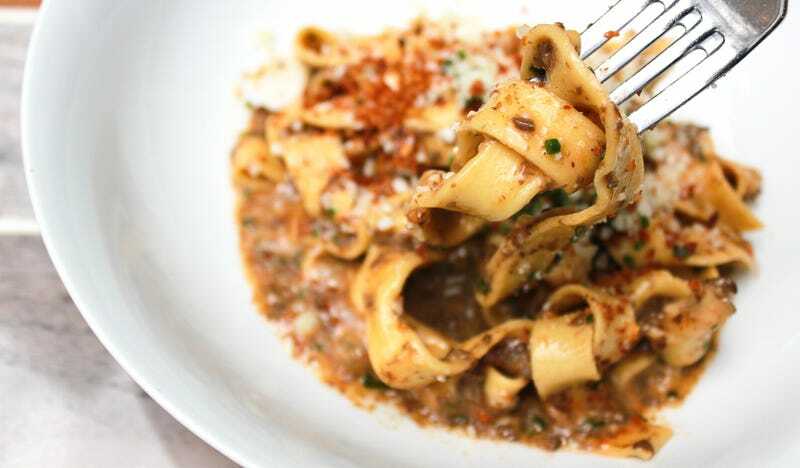 It’s a mushroom bolognese tagliatelle from the Chicago restaurant Somerset, helmed by Michelin-starred chef Lee Wolen. As a lifelong carnivore, this vegetarian pasta feels like the last thing in the world that could be labeled vegetarian—it’s a level 10 in richness and a level 14 in indulgence (my scale goes from 1 to 5). Even though the dish feels meaty and substantial, you’re only two ingredients away in the final step—butter and Parmesan—from making the dish wholly vegan. But the butter, which coats the pasta in that delicious and unctuous way, is key. I don’t ask for recipes from chefs often, but this was an exception. And now it’s yours. Treat it with love and it will love you back. Grind the carrots, mushrooms, and garlic through a medium die in a sausage grinder (or, pulse in a food processor). Next, sweat the onions in a Dutch oven until translucent. Add the tomato paste to the onions and cook until it’s a rust color. Add white wine to deglaze and reduce until the mixture is almost dry. Then add in the carrot-mushroom mix. Cook down until the liquid from mushrooms evaporates, then add water/stock and the sachet of herbs. Cook until liquid is reduced and mushroom flavor is very concentrated. Season with salt and sherry vinegar. Cook pasta in a pot of boiling, salted water. Separately, add about half of the mushroom bolognese (freeze the rest for another day) into a pan to heat. Add butter, olive oil, and pasta water. Bring this sauce to a boil. Stir in cooked pasta. Finish with salt and Parmesan to taste.